One sunny Saturday morning a few months ago, several friends and I stood looking around hopefully, trying to pick out our prospective guides in the clamor and jangle of Portsmouth Square. At 11:00 sharp a trio of smiling young people strode up and cheerfully introduced themselves as Alan Tam, Calvin Yan, and Diana Pang — our guides-to-be in the notorious and romantic alleys of Chinatown. 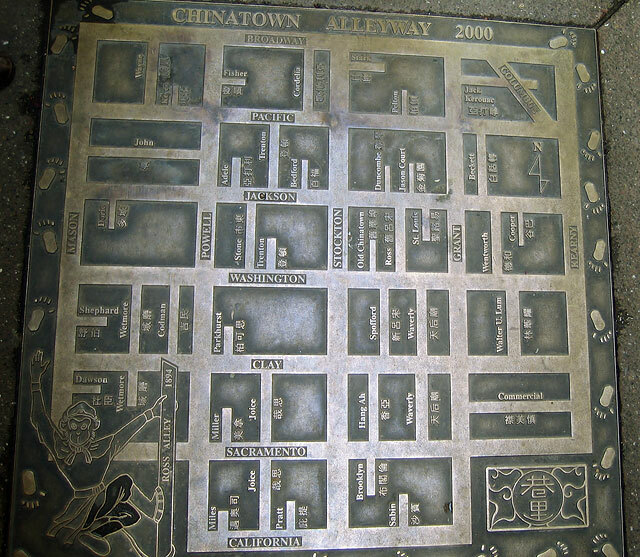 There are dozens of Chinatown tours in San Francisco, featuring everything from double-decker buses to cooking classes, but the idea of a tour focused on the alleys attracted the side of me that’s always seen San Francisco as a “noir” city, a city of fog, shadows and intrigue — so “Chinatown Alleyway Tours” it was. 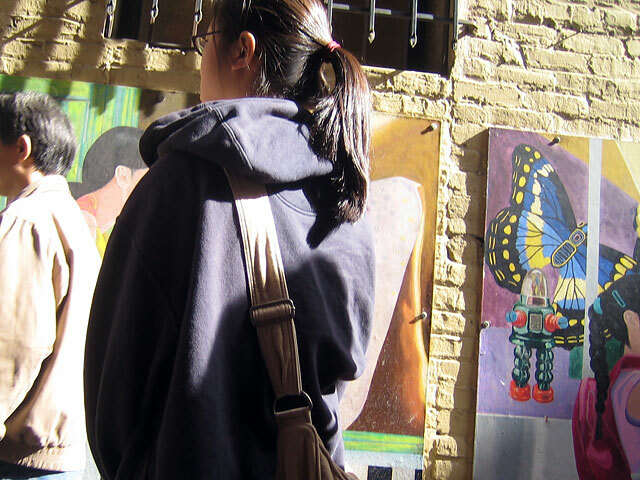 A lot of the charm of Chinatown Alleyway tours is that the history is served up by enthusiastic young San Franciscans — 16 to 21 years old — all San Franciscans, and mostly from Chinatown. What’s more, we quickly discovered that our wallets were aiding a good cause, and one which explained the Tour’s back-street focus: the non-profit Adopt-An-Alleyway Youth Project. Because the alleys are not officially city streets (they’re less than 32 feet wide), they are not City responsibility. The cleaning fell to the property owners themselves, who were for one reason or another were unable or unwilling to clean up the detritus. It wasn’t until the attention of these energetic kids that the dark and sometimes dangerous filth of the old alleyways was cleaned up. The group makes sure that the alleys stay clean, with volunteer crews patrolling on a regular basis. They keep the alleys clear and polish the helpful brass maps installed in the ground at regular intervals. It’s a gift to the neighborhood from its own children. Okay, so my initial thought — the exploration of dank, forgotten alleyways — was a little off the mark, but this turns out to be a positive development. The mission of this group, sponsored by the Chinatown Community Development Center, is Chinese cultural education, for the public, and each other. Older youth teach the young ones through these tours, and this cultural transmission is a beautiful thing. The first Buddhist temple in North America is on Waverly Alley! Sample a fortune cookie from the factory on Ross! 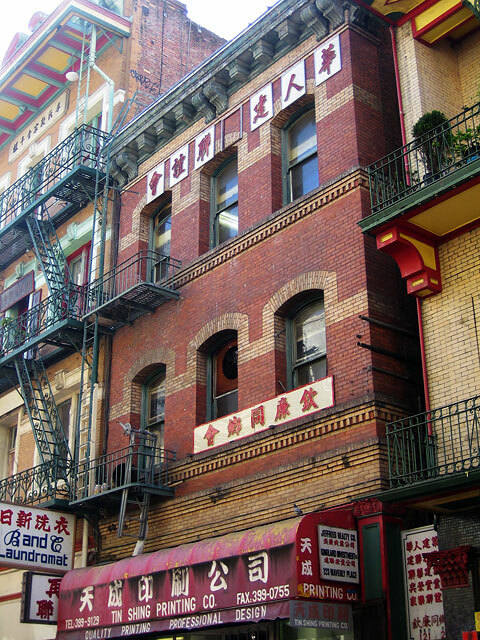 Those picturesque pagoda-style buildings all over Chinatown? Designed by white folks! What’s the connection between the Freemasons and Nationalist revolutionary leader Sun Yat Sen? These comprise just a few of the fascinating subjects touched upon — not too deeply, but then again we covered a lot of territory in two hours. My Fortune Cookie podcast was inspired by this tour, and I now have a dozen more lined up in my notebooks. This is a tour for San Franciscans, not just tourists — it exposes not only the historical Chinatown, but the contemporary scene. The modern encroachment of the financial district, historical effects of racism and the social problems of the community were freely discussed, including the ironic truth that much of the touristy attractiveness of the crowded quarter is the result of generations of poverty. Our three guides took turns holding forth. The variety of their personal experiences — one had emigrated from China as a toddler and still attended high school in Chinatown, another was a third-generation American and currently a student at UC Berkeley — added interest to the stories, and though they didn’t dig deeply into every subject, and (truth be told) some of their facts were slightly out of order, the enthusiasm for their history more than made up for it. I’m guessing that this is the reason that the tour regularly wins Bay Guardian and SF Weekly “Best of the Bay” awards. My friends and I had a terrific time with these young people, and by the end of our two hours we felt like old friends, parting with hugs, handshakes, and a happy feeling. Should you take this tour? Absolutely! Thanks for your wonderful comment on the value of our tour program! It’s Diana checking-in, and I encourage you to continue inviting your friends and podcast listeners to venture to the (not-so) mean streets of Chinatown for this experience — I have since phased out and more vibrant energy, clearer and more profound voices, and newer stories, are taking the helm and transforming the Chinatown Alleyway Tours.